I’ve learned a lot about the whole book to film process by following my son’s hugely popular adventure story for young readers, The Lightning Thief, undergo that transformation. The author has very little to do with the movie, in this case and many cases, but it’s fun to anticipate how the characters will be portrayed. Here’s short movie trailer that gives me some clues – it looks exciting! One of the amazing things is just how long it takes to get a book from manuscript to market, and once the film rights are acquired, it seems to take forever (even after the filming is completed) to get it edited and into the theatre. 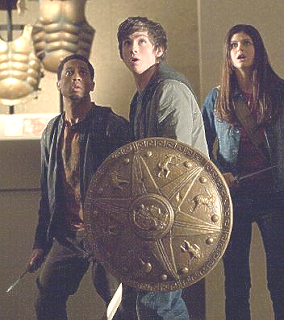 I understand that there are many special technical and digital effects in Percy Jackson and the Olympians: The Lightning Thief – that could be part of it. The director, Chris Columbus, has also directed two of the Harry Potter movies and certainly understands the genre, so I am looking forward to the film, which is still – sigh – four months away.